A large group of silicate minerals. The most abundant group of minerals in Earth's crust. 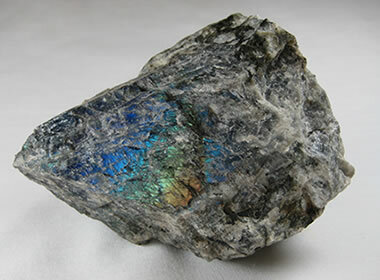 Labradorite is a phenomenal feldspar mineral. The word "labradorescence" refers to the iridescent colors that can be seen on specimens like this one. This rough is about four inches across and was collected near Nain, Labrador, Canada. “Feldspar” is the name of a large group of rock-forming silicate minerals that make up over 50% of Earth’s crust. They are found in igneous, metamorphic, and sedimentary rocks in all parts of the world. Feldspar minerals have very similar structures, chemical compositions, and physical properties. Common feldspars include orthoclase (KAlSi3O8), albite (NaAlSi3O8), and anorthite (CaAl2Si2O8). To appreciate the importance of feldspar as a rock-forming mineral, let’s consider its abundance in Earth’s crust. Most of Earth’s continental crust is made up of igneous rocks such as granite, diorite, and granodiorite. Feldspars are also important constituents of gabbro and basalt, which are the primary types of rock in Earth’s oceanic crust. The accompanying chart shows how these rocks are made up mostly of feldspar minerals. As these igneous rocks are weathered and metamorphosed, their feldspar minerals become components of sediments, sedimentary rocks, and metamorphic rocks. Feldspar minerals have many uses in industry. They are used to manufacture a wide variety of glass and ceramic products. They are also widely used as fillers in paints, plastics and rubber. Several popular gemstones are feldspar minerals. These include moonstone, sunstone, labradorite, amazonite and spectrolite. Feldspar mineral classification: This ternary diagram shows how feldspar minerals are classified on the basis of their chemical composition. The sequence of minerals along the left side of the triangle represents the solid solution series of the alkali feldspars. The sequence along the base is the solid solution series of the plagioclase feldspars. Triangular graph paper can be obtained from waterproofpaper.com, a GeoShops.com website. In this generalized composition, X can be any one of the following seven ions: K+, Na+, Ca++, Ba++, Rb+, Sr++, and Fe++. 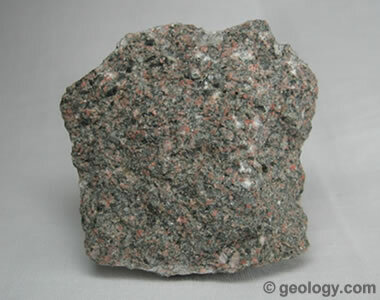 Feldspars that include potassium, sodium and calcium ions are very common. Barium, rubidium, strontium and iron feldspars are very rare. The accompanying triangular diagram illustrates two solid solution systems that comprise the feldspar group. The plagioclase feldspars form a solid solution series between the end members of pure albite (NaAlSi3O8) and pure anorthite (CaAl2Si2O8). The alkali feldspars form a solid solution series between pure albite and potassium sanidine (KAlSi3O8). A list of feldspar minerals with their chemical compositions can be seen in Table 1. Albite and anorthite have an interesting relationship. Albite is a sodium feldspar, and anorthite is a calcium feldspar. Both of them form by crystallization from a melt. In nature, many melts contain abundant sodium or calcium, along with abundant aluminum, silicon and oxygen. 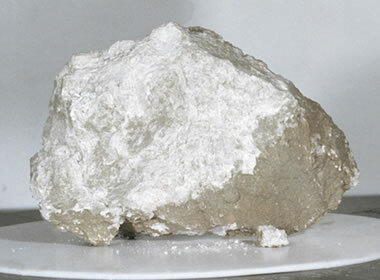 As a result, most albite will contain some calcium substituting for sodium in its crystalline structure, and most anorthite will contain some substitution of sodium for calcium in its crystalline structure. If a sodium ion with a 1+ charge substitutes for a calcium ion with a 2+ charge, a balancing substitution of an aluminum ion with a 3- charge for a silicon ion with a 4- charge will also occur. The relative abundance of sodium and calcium in melts varies greatly, and the full series of mineral compositions between pure sodium plagioclase and pure calcium plagioclase does occur. This continuum of compositions is known as a solid solution series because it is analogous to a melt with dissolved sodium and calcium ions suspended in various positions throughout the solution that we refer to as a melt. Although the range of mineral compositions between pure albite and pure anorthite is made up of very similar minerals, there are differences in their chemistry and physical properties. To facilitate communication, names are given to the feldspar minerals at different positions in the plagioclase solid solution. These names are arbitrary and based upon the relative amounts of albite and anorthite in their composition. The names of these plagioclase minerals with intermediate compositions are summarized in the accompanying table. They can also be seen forming the plagioclase feldspar series along the base of the triangular diagram described above. Feldspar minerals with compositions that range between NaAlSi3O8 and KAlSi3O8 are known as alkali feldspars. They include albite (NaAlSi3O8), anorthoclase ((Na,K)AlSi3O8), sanidine ((K,Na)AlSi3O8), orthoclase (KAlSi3O8), and microcline (KAlSi3O8). Albite and sanidine form a solid solution series between NaAlSi3O8 and KAlSi3O8. Anorthoclase, with a composition of (Na,K)AlSi3O8, occupies the intermediate position between them. Orthoclase and microcline usually have compositions that are very close to KAlSi3O8. Sanidine can also have a composition very close to KAlSi3O8. These three KAlSi3O8 minerals are polymorphs, meaning they have the same chemical compositions but different crystal structures. Sanidine has a monoclinic structure, orthoclase is monoclinic, and sanidine is triclinic. The determining factor for the formation of these three minerals with a KAlSi3O8 composition is temperature. Sanidine is the high-temperature form, orthoclase is the intermediate-temperature form, and microcline is the low-temperature form. Arkose is a sedimentary rock that forms from the weathering of feldspar-rich igneous and metamorphic rocks. It is a sandstone that contains at least 25% feldspar. In sedimentary deposits produced from the weathering of feldspar-bearing igneous and metamorphic rocks, feldspars are usually most abundant close to the source area. Feldspars generally decline in abundance with distance from the source because during transport, they can be attacked by weathering and altered to clay minerals. In addition, their two directions of perfect cleavage make them vulnerable to mechanical weathering, which decreases their particle size and exposes a greater surface area to chemical weathering. Arkose is a sedimentary rock that forms from the weathering of feldspar-rich igneous and metamorphic rocks. This origin is evident because arkose is a sandstone that contains at least 25% feldspar, usually in the form of grains that can be easily identified as feldspar. Arkose is usually found immediately down gradient and close to the outcrops from which the feldspar grains were weathered. Long transportation distances destroy the feldspar grains, and extended exposure to weathering converts the feldspars into clay minerals. Clay minerals are feldspar’s other contribution to the sedimentary record. They accumulate as mud or soil and often form sediments that become shales and mudrocks. Right-angle cleavage: One of the most diagnostic properties of feldspar is its two directions of cleavage that usually intersect at or close to ninety degrees. Color Usually white, pink, gray or brown. Also colorless, yellow, orange, red, black, blue, green. Cleavage Perfect in two directions. Cleavage planes usually intersect at or close to a 90 degree angle. Diagnostic Properties Perfect cleavage, with cleavage faces usually intersecting at or close to 90 degrees. Consistent hardness, specific gravity and pearly luster on cleavage faces. Chemical Composition A generalized chemical composition of X(Al,Si)4O8, where X is usually potassium, sodium, or calcium, but rarely can be barium, rubidium, or strontium. Uses Crushed and powdered feldspar are important raw materials for the manufacture of plate glass, container glass, ceramic products, paints, plastics and many other products. Varieties of orthoclase, labradorite, oligoclase, microcline and other feldspar minerals have been cut and used as faceted and cabochon gems. Although there are many feldspar minerals, they all share a tight range of physical properties that are surprisingly consistent. Most of them exhibit two directions of perfect cleavage that intersect at or close to ninety degrees. An example of this type of cleavage can be seen in the accompanying photo. Most feldspar minerals have a Mohs hardness of approximately 6 to 6.5 and a specific gravity between 2.5 and 2.8. They all have a vitreous luster that is often pearly on cleavage faces. The accompanying table shows the generalized physical properties of the feldspar mineral group. These consistent properties of feldspar are extremely useful even when the feldspar crystals are very small. People who are familiar with feldspar cleavage can pick up an igneous rock that contains crystals of just a few millimeters in size, examine it with a hand lens, and easily differentiate the feldspars from other minerals in the rock. 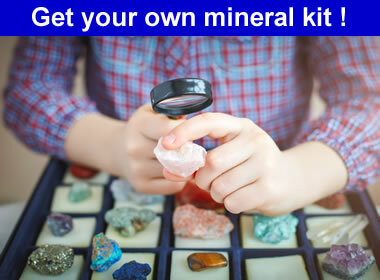 With minimal practice they can also use a set of mineral hardness picks and a hand lens to determine the Mohs hardness of such tiny grains. Buddingtonite is an ammonium feldspar with a chemical composition of (NH4)(AlSi3)O8. It has been found where feldspar minerals have been altered by hydrothermal activity. Banalsite (Na2BaAl4Si4O16) is a rare barium feldspar. It forms a complete solid solution series with stronalsite (Na2SrAl4Si4O16), in which barium and strontium substitute for one another. Celsian, paracelsian and hexacelsian are rare barium feldspars and polymorphs that share the chemical composition of BaAl2Si2O8. They form in low-temperature hydrothermal environments. Rubicline is a rare rubidium-bearing feldspar with a chemical composition of (Rb,K)(AlSi3O8). It is similar to microcline but has never been found without potassium and rubidium substituting for one another. 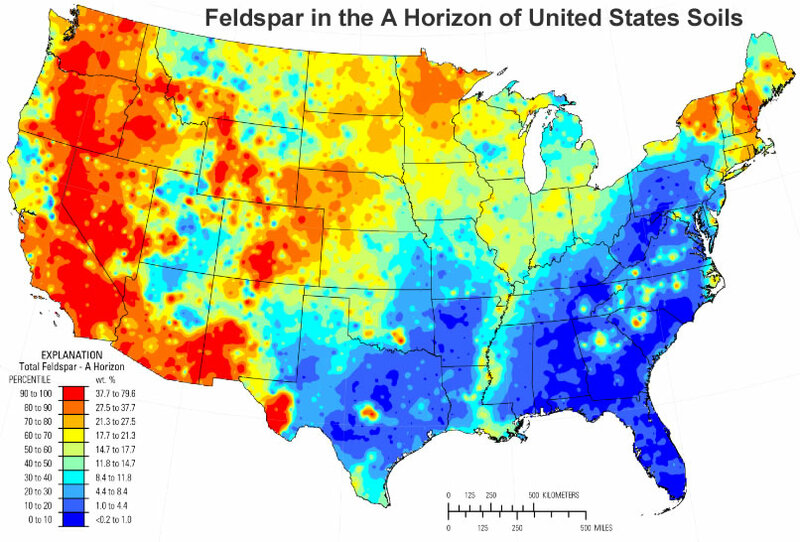 Feldspars in Soils: This map shows the distribution of feldspar group minerals in the A Horizon of United States soils. The abundances are highest in areas where igneous rocks outcrop at the surface, such as New England, the Rocky Mountain area and the West Coast. Click the image to enlarge. About 600,000 metric tons of feldspar is produced each year in the United States. Most of this feldspar is crushed into fine granules or powders and then consumed in factories that produce plate glass, ceramic tile, fiberglass insulation, paints, plastics, pottery, container glass and other products. Most of these products play an important role in commercial and residential construction, and the demand for feldspar is supported by the health of the construction industry. Almost all of the feldspar production in the United States is from quarries in North Carolina, Idaho, California, Virginia, Oklahoma and South Dakota. These locations produce enough feldspar to supply nearly all of the nation’s consumption. The resource available for future production is enormous. The only challenge is that the feldspar resource might not be located at a convenient distance from points of consumption. Nevertheless, the United States' annual net import reliance as a percentage of apparent feldspar consumption is low - usually no more than 10 to 20%. Aventurescent sunstone: Close-up photo of a sunstone cabochon, showing beautiful flashes of aventurescence caused by light reflecting from the copper platelet inclusions within the stone. Blue labradorite: Photograph of a labradorite cabochon with an electric blue play-of-color. Photograph copyright iStockphoto / Joanna-Palys. 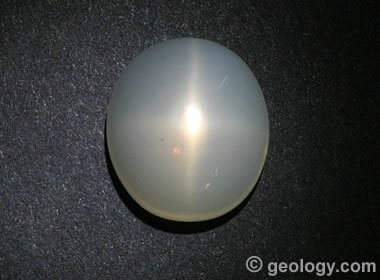 Star Moonstone: A moonstone cabochon that exhibits a rare four-ray star. 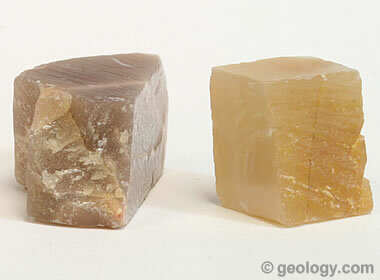 Several varieties of feldspar minerals are used as gemstones. Three of them, moonstone, sunstone, and labradorite, are known for their unique optical phenomena. Moonstone is a gem material that consists of microscopically thin and alternating layers of feldspar minerals of different compositions. When light enters a polished gemstone and encounters these layers, it is scattered in many directions. This produces a glow within the gemstone known as adularescence. The glow appears to float slightly under the surface of the gem and moves as the source of illumination moves, as the angle of observation is changed, or as the gemstone is moved under the light. People enjoy this soft glow, especially when it has a striking color or the body color of the moonstone is pleasing. Orthoclase is the most common feldspar mineral to host the adularescent phenomena; however, it is also known in albite, oligoclase and labradorite. Sunstone is a gem that contains tiny plate-shaped and highly reflective particles with a common orientation. When light enters the gemstone, it strikes these particles and they reflect it with a glittery flash known as aventurescence. The particles might be tiny flakes of copper, hematite, mica or other reflective mineral. Labradorite and oligoclase are the feldspar minerals that most often have aventurescence. In some localities colored but non-aventurescent labradorite is also called “sunstone,” but aventurescent material is usually mined nearby. Labradorite is sometimes intergrown in microscopic layers with albite or other plagioclase minerals. When light enters a polished gem and strikes these layers at just the right angle, the light is scattered, its wavelengths are modified, and an iridescent reflection is produced. This can result in spectacular flashes of strong iridescent colors in electric blue, green, yellow, orange and pink. This phenomena is known as “labradorescence” and named after the mineral that is best known for producing it. The phenomenal properties of moonstone, sunstone and labradorite are almost always cut as dome-shaped cabochons. Their phenomenal properties are dependent upon light striking microscopic structures within a polished stone at just the right angle. To make that happen, skilled craftsmen who understand the optical phenomena of these gems must study the rough and cut the stone so that the planes where the optical phenomena are produced are parallel to the bottom of the cut gemstone. Alert cutters might notice rare chatoyancy or asterism in moonstone rough. With proper planning, orientation, and skillful cutting, this rough can be used to produce cabochons that exhibit a cat's eye or a four-ray star. Moonstone is the best known of the phenomenal feldspars, but it is not found in many popular jewelry stores. All three of these gems are best found at gem and lapidary shows or at stores that specialize in unique and interesting gems and jewelry. They can be easily found online; however, it is best to buy these stones or jewelry set with them where you can pick them up, play them in the light, and examine the strength, color and pattern of the optical effect. If you have a number of pieces to select from, examine many of them because one or several of them will appeal to you much more strongly than the others - and different stones will appeal to different people. It is best not to leave this to a random selection by the vendor or a friend. You will be happiest if you pick the one that appeals to your eye. 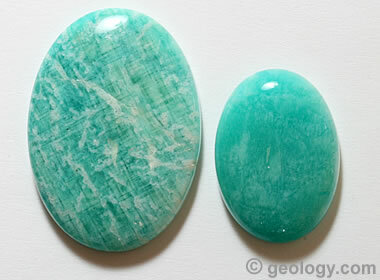 Amazonite cabochons: Amazonite is a trade name for a green to bluish-green variety of microcline feldspar that is often cut into cabochons, beads and tumbled stones. Faceted feldspar: Two specimens of labradorite feldspar that have been cut into faceted stones. Specimens from Oregon are often called "sunstone" - even nonphenomenal specimens without the aventurescence that many people believe is needed to merit the "sunstone" name. What is Feldspar? Website article, Industrial Minerals Association of North America, last accessed February 2017. Filatovite, K(Al,Zn)2(As,Si)2O8, a new mineral species from the Tolbachik volcano, Kamchatka peninsula, Russia: Vergasova, Lidiya P.; Krivovichev, Sergey V.; Britvin, Sergey N.; Burns, Peter N.; and Ananiev, Vladimir V. European Journal of Mineralogy, Volume 16, Number 3, p. 533-536, June 2004. Ferroan Anorthosite: Lunar Sample Compendium, NASA, 2011, last accessed February 2017. 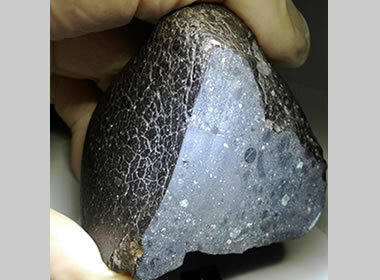 Researchers Identify Water Rich Meteorite Linked To Mars Crust: website article, NASA, January 2013. 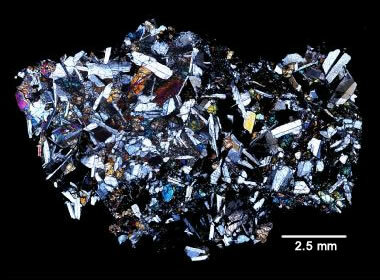 Meteorites from Vesta Asteroid: Website article by Geology.com. Mineral Resources On-Line Spatial Data, an interactive mapping system for mineralogy and geochemistry on the United States Geological Survey website, accessed August 2017. Although phenomenal feldspars are hard to compete with, there are a few other feldspars that make noteworthy gemstones. These are also best found at gem and lapidary shows or stores that specialize in interesting and different types of gems and jewelry. Amazonite is a trade name for a green to bluish-green variety of microcline feldspar that is often cut into cabochons, beads and tumbled stones. The green color is caused by trace amounts of lead within the mineral. A world-famous locality for amazonite crystals is in the Freemont, El Paso and Teller Counties area of Colorado where it is found growing with smoky quartz in cavities of igneous and metamorphic rocks. Although the name "amazonite" suggests that Brazil is a major source of the material, it is not found in the Amazon Basin. Feldspar minerals are often found in transparent crystals of gem quality. Orthoclase, labradorite and oligoclase are examples of feldspar minerals that have been faceted. Gemstones cut from these minerals can be beautiful; however, they are rarely seen in jewelry because they are not well known and requested by jewelry customers. In addition, faceted feldspars have durability concerns because of their Mohs hardness of 6 to 6.5 and their two directions of perfect cleavage. 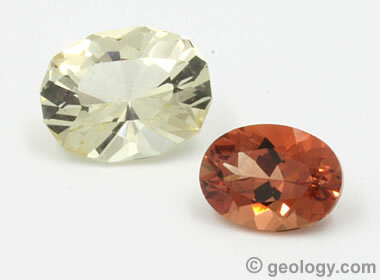 Most feldspars that are faceted are for the "collector gems" market.